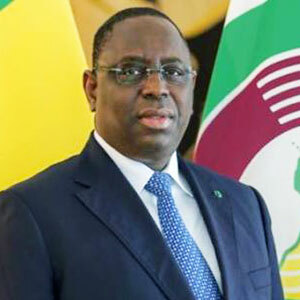 Macky Sall was born in Fatick, Senegal on 11 December 1961. He pursued a geological engineering degree from the Institut des sciences de la terre (IST) in Dakar, and studied in Paris at the École nationale supérieure du pétrole et des moteurs (ENSPM) in the Institut français du pétrole (IFP).He launched his political career by becoming Secretary General of the Fatick regional convention for the Socialist Party (PDS) in 1998. He then served as Special Advisor for Energy and Mines under President Abdoulaye Wade from 6 April 2000 to 12 May 2003. Shortly thereafter, Sall became Minister of State for the Interior and Local Communities. In 2004, President Wade appointed him Prime Minister when his predecessor, Idrissa Seck, was dismissed. Sall continued to work with President Wade, serving as director of Wade's re-election campaign for the 2007 presidential campaign, which President Wade won. Sall was then elected President of the National Assembly as part of the Sopi Coalition, in 2007. Sall and President Wade had a falling out after Sall called Wade’s son in front of the Assembly for an audit on construction sites in Dakar. When he refused to resign from office, Sall’s position as number two of the PDS was abolished, the mandate of the President of the National Assembly reduced from five to one year, and he was accused of money laundering, for which he won a dismissal. At the end of 2008, he left the Senegalese Democratic Party (PDS) and created, with thirty executives of the PDS, the political party Alliance for the Republic. In 2009, he was elected as Mayor of Fatick. In 2012, he ran against Wade in the February presidential elections. Initially he obtained 26.5% of the vote against Wade's 34.8%, leading to a runoff. On 25 March 2012, Wade conceded the race to Sall, after the run-off elections demonstrated that he had won a clear majority. Sall was inaugurated as the fourth President of Senegal on 2 April 2012. He is currently the Chairman of the Economic Community of West African States (ECOWAS).